Can you point me to the firmware i have to put on my esp8266 to get this running ? Especially when the esp is connected to an arduino? i want to do the same thing and as it seems you got things working now really good . What stuns me is that Google is just NOT picking this up – here’s the link..
Great articles by the way, and Node-Red is definitely a great home automation tool! I started with the ESP8266 and trying to make it work with MQTT, but not having much success. I got tuanpm’s MQTT firmware, but am having some difficulties getting it to respond to topics and/or controlling GPIOs based on the input. Given your experience, maybe worth doing an article about how you tackled this? Well, I lost a LOT of time until I got it into a decent environment like ECLIPSE – and that makes life easier. The subject is BIG – you should be well familiar with using a desktop tool like mqtt-spy to talk to your broker – once that is working a treat – then you need to be able to go into the /include/userconfig.h file and put your details in there. Here for reference are mine – minus my password of course. That works a treat and it will now respond in the serial debug – in /user/user_main.c you’ll see the subjects it subscribes to (wifiConnectCB) and in mqttDataCb you can trap any incoming messages, read them and even send outgoing messages..
I’m not sure why but when I add it in user_init(), the off command doesn’t seem to work. Once I moved it to inside the loop evaluating the received topic (right before the GPIO_OUTPUT_SET lines it works correctly). The only thing I can think of is when added to user_init it briefly sets it as an output but then something else in the MQTT code resets it so when it hits the GPIO_OUTPUT_SET they don’t work. Well, I would just whizz over to my open project and confirm but the sodding power went out last night and I have 3 virgin screens in front of me… hang on…. Yes in user_main.c right at the start.. 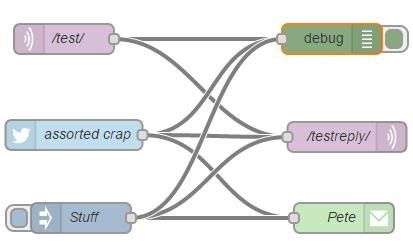 Someone needs to write a simple set of macros we can put at the start of our projects- I’ve never seen such complicated nonsense.. what’s wrong with.. In the UART function it initializes UART1 which maps GPIO2. I’m sure you know this since you have yours working but in case anyone else struggles with this I wanted to post a note. Thanks for all the great info by the way! Very much enjoy the blog. And thank you for that. Next stop – adding in DHT22 code to grab temperature. I know the ESP-01 is cheap and easy but this lack of IO is starting to grate a little. Thanks Peter, I’m away for a few days but will definitely try when I get back! All good fun and manic times again:) Keeps the cells going, although having a few years on you, not so many of them to use! Just for the record, I started with mosquitto on an RPi, and as you had made a note of, it couldn’t keep up with the 50mS stream from Spy. Lost every other one. Then it all started playing up, so I moved on to the really small broker. 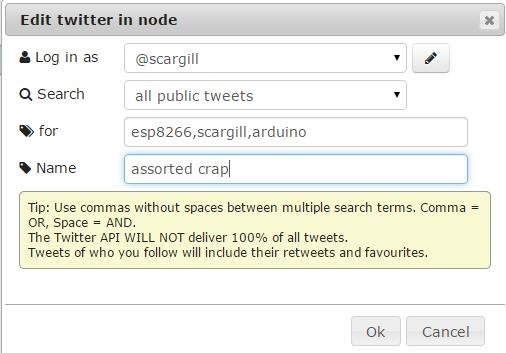 Spy didn’t work too well there, being rejected for sending unknown versions of mqtt. I then got an old laptop up with mosquito, (vista believe it or not), and it has been good as gold so far. Mosquitto will install as a service, so that was handy. I did the 50mS runs, and put some messages from phones in at the same time. The log showed all were received. 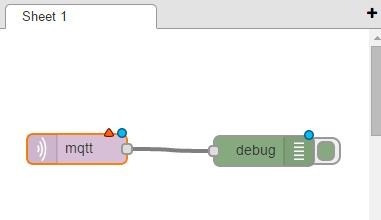 Having a look at mqtt-warn at the moment. As far as using ssr’s are concerned, my concern would be to only use them where it would be an inconvenience if they failed, as they will normally fail short circuit. (if / when they fail). Electromechanical relays are not the ideal components to have to use, but at least they do provide complete isolation, and very rarely fail closed. (welded contacts / arcing etc). You are giving a lot of inspiration with this blog and the detail in it, so just a thanks from me for the hours you spend keeping it up. Thanks for the kind words, Dave.. Some comments on the above.. I’ve now seen at least 4 items that “Suggest” that the PI is not up to the job – well, it’s putting me off buying one. I can manage with Mosquitto and MQTT-SPY just under 1m repeats – in other words 1000 round trips a second – actually I could probably manage more but the test script has a ms timer 🙂 I can get that just as easily from Really Small Message Broker – which I was VERY happy with – but… I have this DISKSTATION and Mosquitto – so from a reliability point of view that clearly is my choice – but I had NO problems with RSMB on a PC acting as a service. So a couple of options for people there. What is will say is that the RSMB instructions are a hell of a lot nicer to humans than the documentation for Mosquitto. SSRs – good point – I’d forgotten about that – I used to do home control years ago as part of our business and we developed some little boards using a PIC – early attempts at using TRIACs with compact fluorescents were disastrous and indeed we ended up with shorts. Ultimately our boards used the PIC to feed a MOC20 – which fed the TRIAC and we put a 400v VDR across the (load or triac, can’t remember) – all the problems went away. If course today’s solid state relays I have no idea what’s inside them – your point about mechanical relays are well taken – I bought some SSRs because of their 3v operation – ie ESP8266, SSR, 3v3 supply and nothing else… time will tell. The new SSRs are pretty good, and they’re used alot in industrial control. I wouldn’t be afraid to use a good one. But they are still significantly more expensive than comparable relays these days, especially when you can get those relay + driver boards from China at under $2 per relay. It appears that you’ve got things sorted out, but for anyone interested in Node-Red with minimal configuration talent, take a look at http://thethingbox.io/. They have put together an image for the Raspberry Pi that integrates every thing you need to get started playing. Copy the image to a SD card and boot the pi. Log into Node Red. Pretty simple to get started! 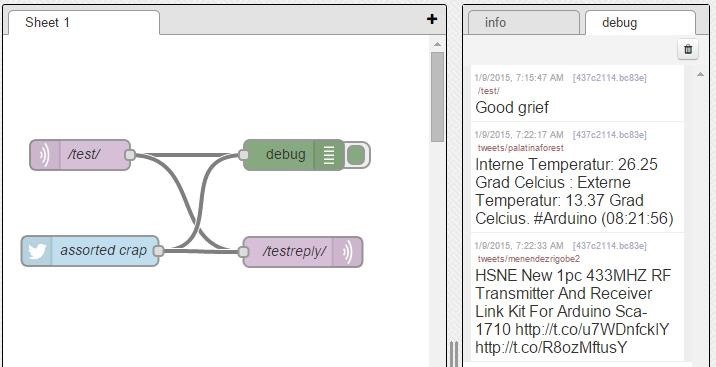 Between your ESP8266 work, openHAB, and Node-Red there is a pretty awesome capability available to the home tinkerer! Thanks for all your good work! I’m similar with node – I didn’t understand what it was – I’m still not happy about it needing an installation on every pc to be used.. but… the results in node red – speak for themselves – that’s a clever bit of programming and I’ve only just started to get into it. More over the weekend no doubt. Note Red need not be installed everywhere. If your logic isn’t too time sensitive, one installation can subscribe to multiple MQTT brokers, take appropriate actions for each, and post back to a local or single consolidation broker. If you use reliable messaging, network latency or occasional dropouts would be covered. If reliability and speed ARE an issue, you’d probably want Node Red running somewhere in your local subnet anyway. Peter, thank you for all your work on ESP8266! I found this site around Christmas and have been glued to it ever since. I appreciate that it is all about Windows installations, too! So I have the latest versions of Mosquitto, Node Red, and MQTT Spy all working properly sending messages, but for whatever reason, I continually fail at getting Node Red to send out e-mails. I tried sending to 3 different e-mail accounts that I have (including Gmail as you show in your write-up) but no success. Would you please provide any hints/settings/screenshots that might help? I’m running a Win7 64-bit machine with JRE 1.8.0_25 but suspect a Java issue with Node Red due to warnings in bold that I see on their homepage. Thanks again and keep up the excellent work! I will await your session on Code Red sending emails. Kee[ up the great work. I know I started this one off – but I’m sitting here playing with node-red – and as an output I’d added a log file – no matter where I put it or what I call it I cannot find the file it is supposed to have created. 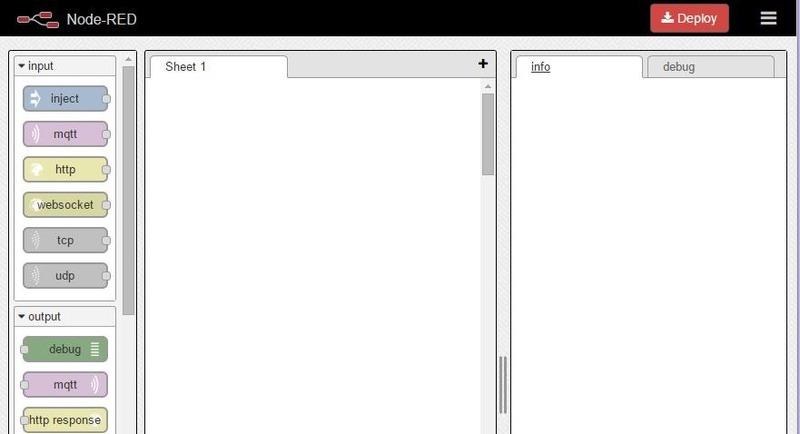 So if I make a file c:\myfile.log it should be sitting in the root – nothing – anyone come across this? What kind of projects do you think Node-Red lends itself to? Any microcontroller with network capabilities? As someone looking for a visual way of programming (like labview or simulink) I seems like it can be a good tool for general learning.. but perhaps best used for only home automation (openHAB) using ESP8266?